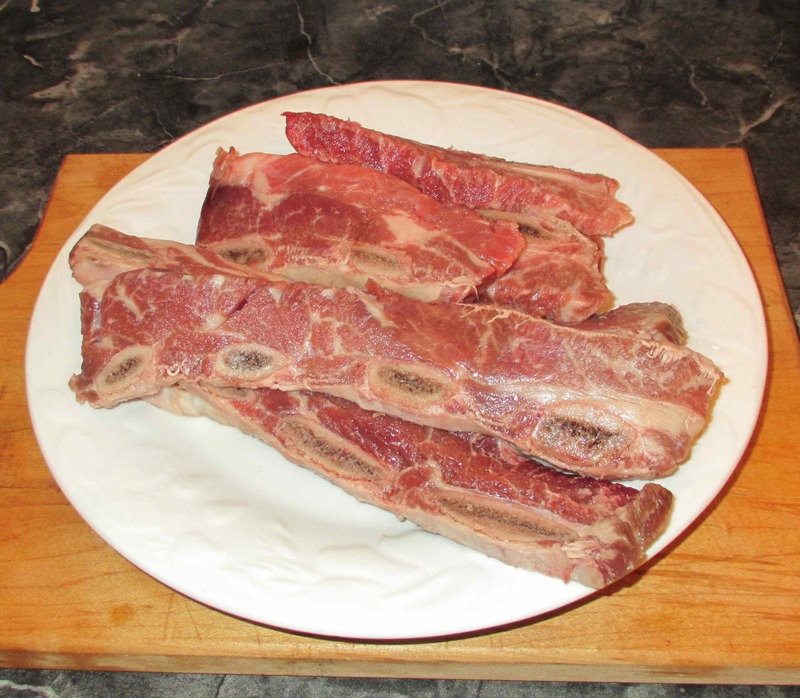 While perusing the contents of my freezer today, I came across some of the same ‘flanken-cut’ beef short ribs that I used to make Pepper Steamed Beef Rib a few weeks ago. 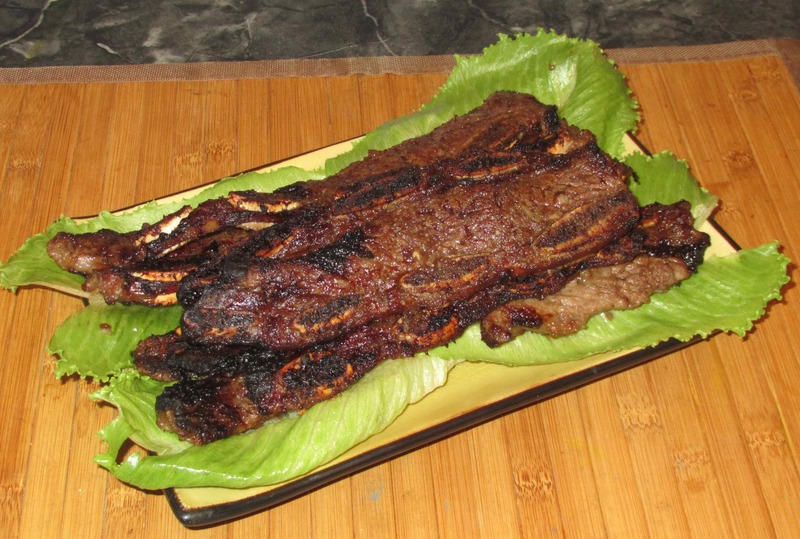 This time, though, I wanted something grilled and I decided to prepare them Korean-fashion along the lines of the popular restaurant offering known as ‘Galbi’ or ‘Kalbi’. These are the ribs I am using. These came in two packages and I notice that the ribs from one were cut quite a bit thinner than the other. I will have to adjust for this while grilling, of course, but it will also be interesting to see which affords the better result. First, mix the marinade ingredients together and let sit for twenty minutes or so to let the flavors combine. 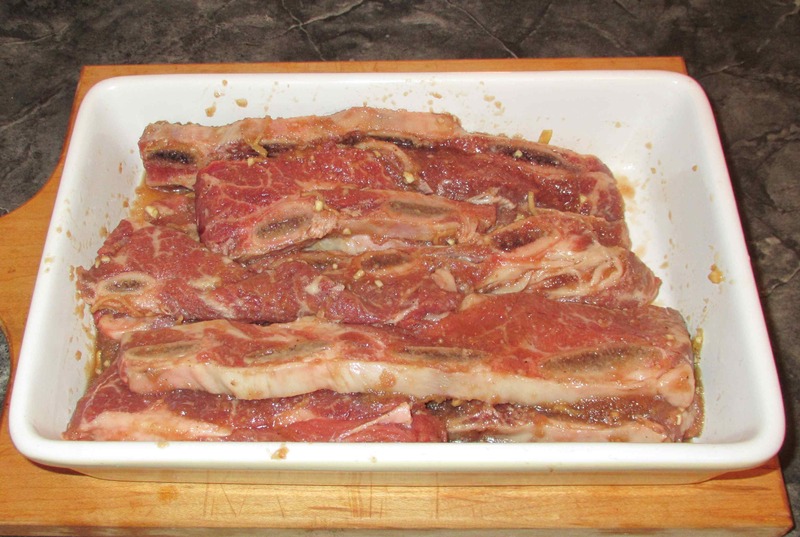 Now, mix the ribs with the marinade and set aside to marinate for at least two hours, turning them periodically. Pre-heat your oven to 450 degrees and then put the ribs on a wire rack over a foil-lined grilling sheet. When you are ready, turn the overhead grill on to high and pop the ribs into the oven just a few inches below the broiling elements. Cook for about 7 or 8 minutes on each side and watch them carefully so that they do not burn. If things are going a bit fast under your broiler, you can always lower them away from the heat a little. Once they are cooked through and have a nice bit of charring here and there, remove from the oven and let rest for a few minutes before serving. The ribs were very good although the thicker ones were still just a little rare in the center. Normally, I like rare beef but for ribs I like them well-done all the way through and so the thinner cut ones suited me the most. 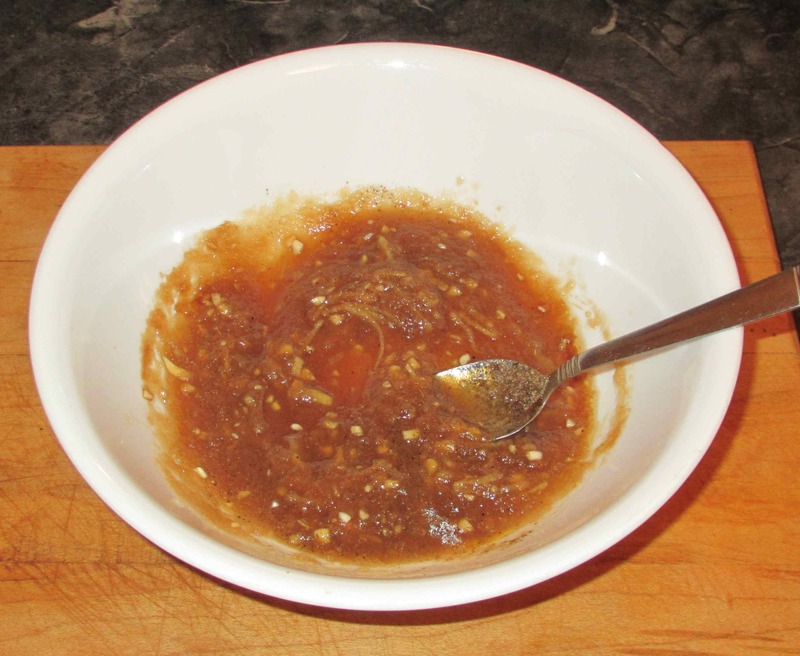 The marinade worked really nicely, with the garlic melding nicely with the sweetness, and the apple sauce enhanced it every bit as well as the more traditional pear. Personally, I found that it could have been just a little saltier (and you may wish to add just a pinch if you try this yourself) but my wife liked the result just the way it was. 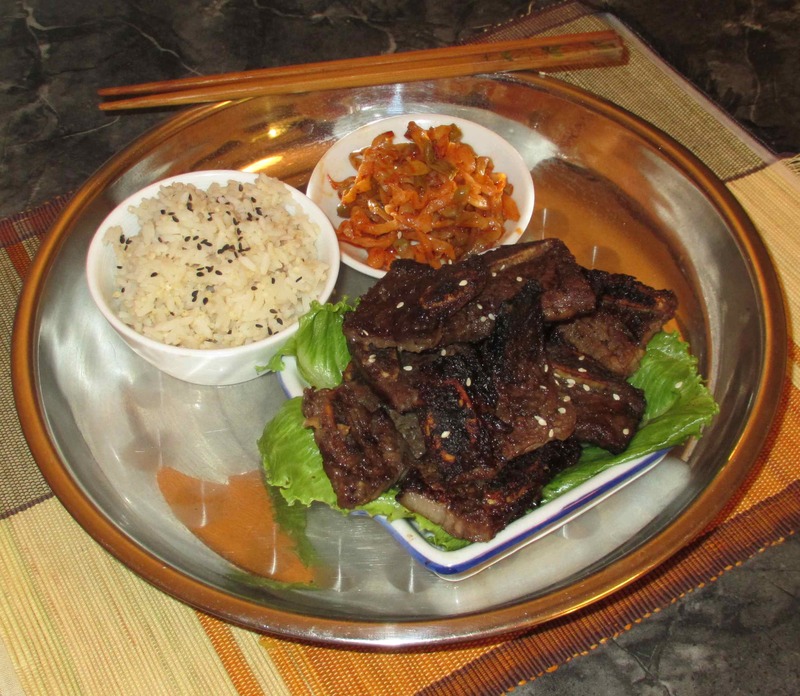 After photographing the cooked ribs, I cut them into bite sized sections for ease of eating and then served them with rice steamed with millet and black sesame, and a spicy Sichuan pickle on the side. 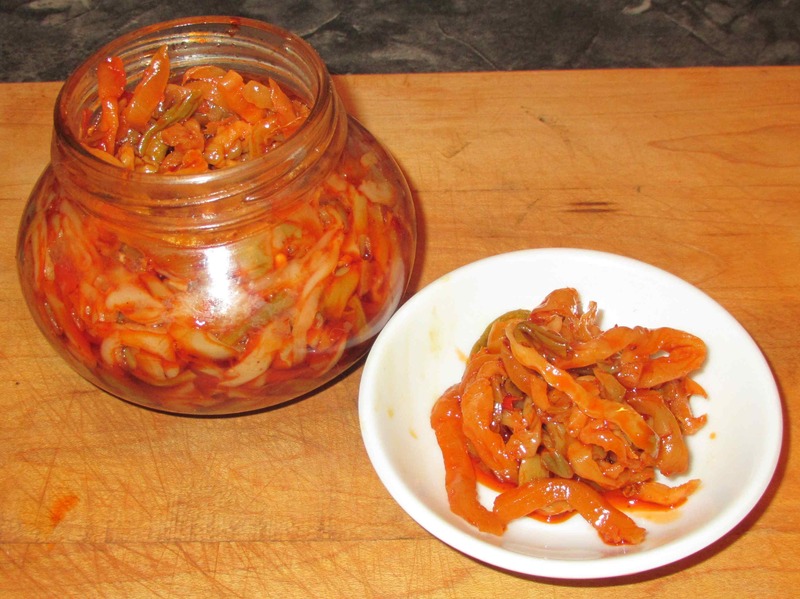 In a proper Korean meal, Kimchi would be a more fitting accompaniment but I had a jar of the Chinese pickle waiting to be tasted and it made a very suitable and tasty substitution here. 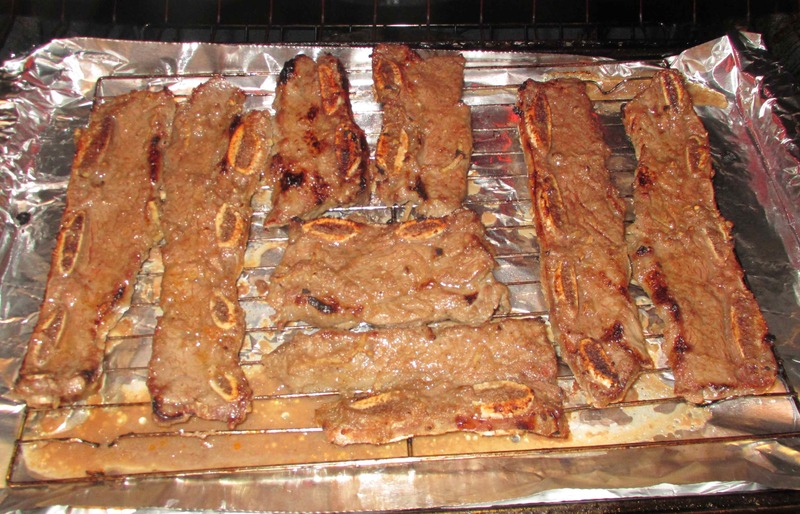 Love Korean ribs!! I’ve never tried a recipe with apple sauce but it sounds intriguing. I’ve seen a few recipes that call for Asian pears but I never remember to buy one when I’m at the store. I usually use a combo of sesame oil, soy, sugar and lime..These look perfect too — crispy and charred, just how I like them! Thank you… I wish that cut was available here more often. Whoa! those cooked super fast! I wasn’t expecting them to be done so quickly. Looks great. Even with the prep-time, looks like a quick and easy meal. I wonder if you marinated it with something like apple cider vinegar or pear vinegar whether you would have more tender ribs. Wouldn’t that break down the connective tissues a bit? I confess a soft-spot for short ribs, no matter how they’re cooked. I love the Korean flavours too. Yours look most excellent. Thank you…. the wife especially loves them. The apple sauce is really nice but just a splash of lemon or lime would be nice too! I must try this. In fact, I think I’ll go tomorrow to get the ingredients. Fortunately it’s not difficult to get Asian pears or kimchi around here. My mouth is watering thinking about that marinade. Great post! Might try this with the asian pears. Strangely enough, the most difficult ingredient to get around here would be the beef ribs. Possibly you could ask a butcher to cut them that way for you specially? Butchers that still process whole cows by themselves are very hard to find, unfortunately. Mine does with lamb, but with beef the ‘heavy work’ is already done at the slaughterhouse and the ribs are gone. Those ribs look amazing! The marinade especially gets my tastebuds tingling! Great recipe! Wow! Looks very yummy! you even made kim-chi? Can’t keep up with you..
Great recipe! I like your idea of using Apple sauce. I should try it next time!